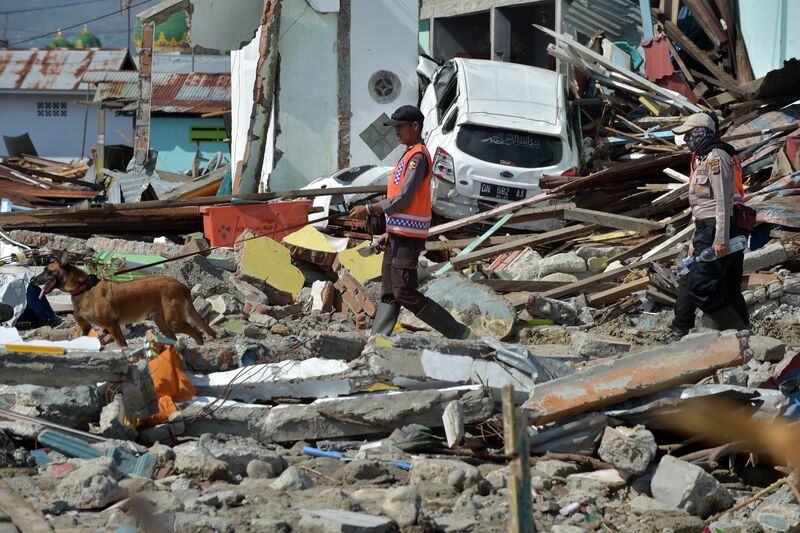 PALU (Indonesia): More than a thousand people could still be missing after Indonesia’s devastating quake-tsunami, officials said yesterday, drastically upping the number of people unaccounted for a week after the disaster. Palu city on Sulawesi island has been left in ruins after it was hit by a powerful quake and a wall of water which flattened houses and flipped over cars, with the official death toll now standing at 1,571. The number of confirmed missing stands at over 100, but fears are growing that vast numbers of people have been buried in a massive government housing complex at Balaroa, where the sheer force of the quake turned the earth temporarily to mush. “Maybe more than 1,000 people are still missing,” Yusuf Latif, a spokesman for Indonesia’s search and rescue agency, told AFP. “But we still cannot be sure because there’s a possibility that some people managed to get out.” After days of delays, international aid is slowly making its way to the disaster zone, where the UN says almost 200,000 people need humanitarian assistance. Survivors have ransacked shops and supply trucks in the hunt for basic necessities, prompting security forces to round up dozens of suspected looters and warn that they will open fire on thieves. Children with plastic containers begged for money by the roadside while some shell-shocked residents scoured for anything still salvageable amongst the debris. “We’re racing against time,” said Dwi Sulaksono, commander of the navy base in Makassar, as supplies were unloaded from an Indonesian warship. “We have to distribute supplies as quickly as possible, especially to remote areas.” Authorities previously set a deadline of Friday for finding anyone trapped under ruined buildings, although chances of pulling survivors alive from the rubble at such a late stage are almost zero. Using sniffer dogs and scanners, rescuers at the heavily damaged Mercure hotel had detected what they believed was a person under mounds of rubble the previous evening but when they resumed the hunt yesterday, all signs of life had disappeared. Survivor Risa Kusuma, who had just moved to Palu with her family to escape Indonesia’s chaotic capital, recounted the horror of the twin calamities. As massive tremors threw the family around like rag dolls, the terrified family of five managed to tumble out of their house and run along asphalt roads that were splitting under their bare feet. “I thought it was doomsday,” the 35-year-old told AFP, days after she and her three children made it back to Jakarta on a flight out of the disaster-stricken region. Some roads remain impassable, detritus from the tsunami is scattered everywhere, and terrified people are sleeping outside in makeshift camps for fear of more quakes. Improvised white flags — a pillowcase or duvet cover — fly outside many homes, signifying a death in the family. Nevertheless there were signs of life returning to normal, with children playing in the streets, radios blaring out music, and electricity back up and running in most places. “Things are improving,” Azhari Samad, a 56-year-old insurance salesman, told AFP at a mosque in Palu. But for the area to recover fully from the disaster “will take years”, he added. “The first six months will be traumatic, maybe in one year we have some progress. The government will help, people will help from all over the country. Indonesians have a big heart.” A state of emergency could be extended for a couple of months “until people in Palu can stand on their own”, Indonesian vice president Jusuf Kalla said during a visit to the shattered city. “Places that can no longer be inhabited like Balaroa must be relocated,” he added. In a village outside devastated Donggala, Irham Hassan gathered with some 200 men at a local mosque for Friday prayers in the world’s biggest Muslim-majority country. About 500 people, many wearing white skullcaps, gathered to pray near Palu’s devastated coastline, where an iconic mosque once on stilts sat lopsided in shallow water by the rocky shore. About 20 planes carrying vital supplies such as tarpaulins, medical equipment and generators are heading from all over the world to the disaster zone. Indonesia was initially reluctant to accept outside help, insisting its own military could handle the response, but as the scale of the devastation became clear President Joko Widodo agreed to foreign aid. Governments from Australia to Britain are flying in supplies, the United Nations has pledged $15 million to the relief effort, and aid groups including Save the Children and the Red Cross are also on the ground. More than 1,000 may still be missing in Indonesia disaster 0 out of 5 based on 0 ratings. 0 user reviews.